I've released it at the Wired'98 demoparty (17-19 July) in Belgium. It took me a whole week to draw this, since it has been done pixel per pixel. 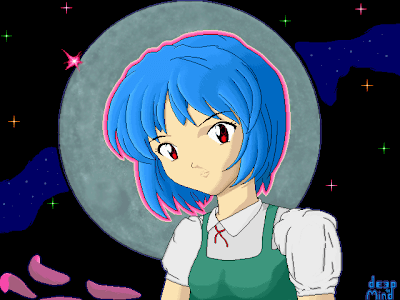 The character is Ayanami Rei from Neon Genesis Evangelion, and the picture is named after the anime end theme song: Fly me to the moon.